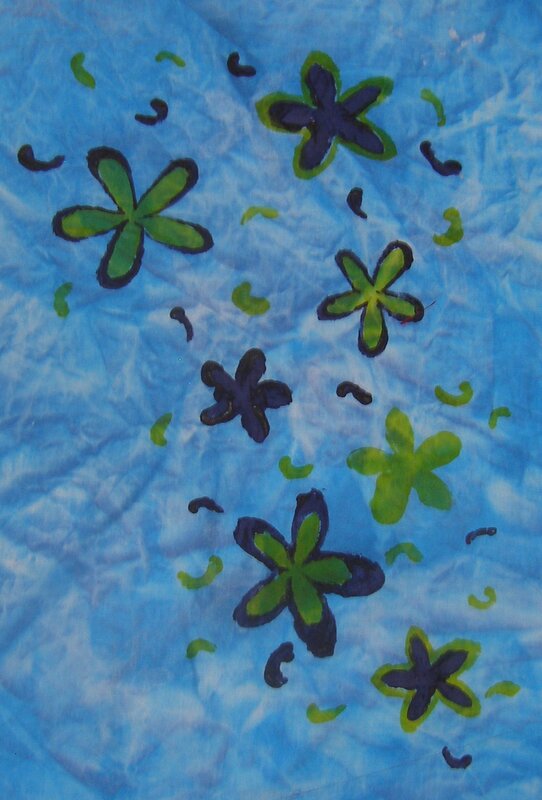 Stage 2 is to select at least 4 design ideas that could be translated onto fabric, with stage 3 being actually experimenting with small samples of these design ideas using different printing methods. 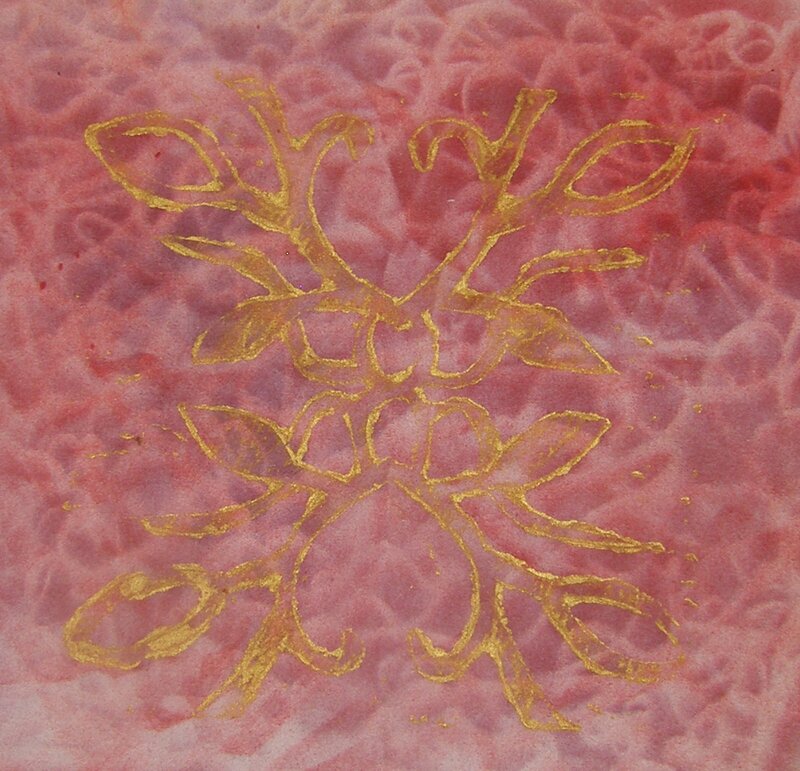 This is the petals design from my Poinsianna flower drawing. 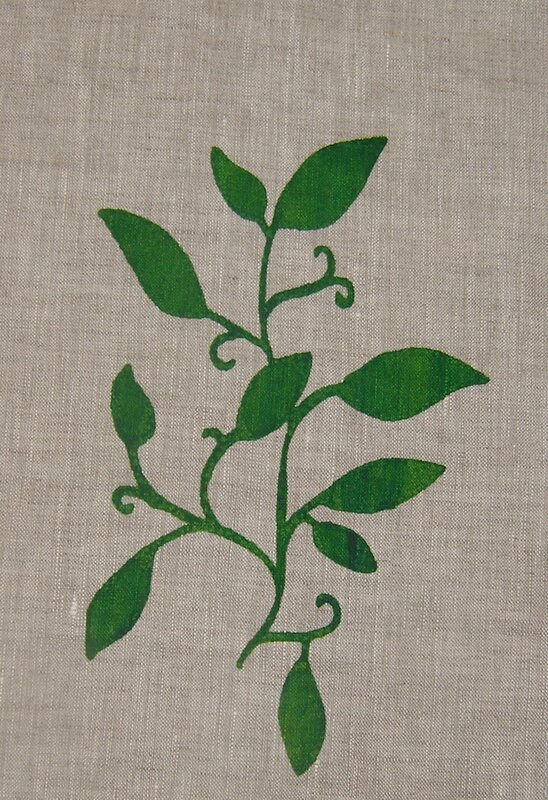 I prepared a stencil and then used Shiva paintstiks on silk dupion fabric. 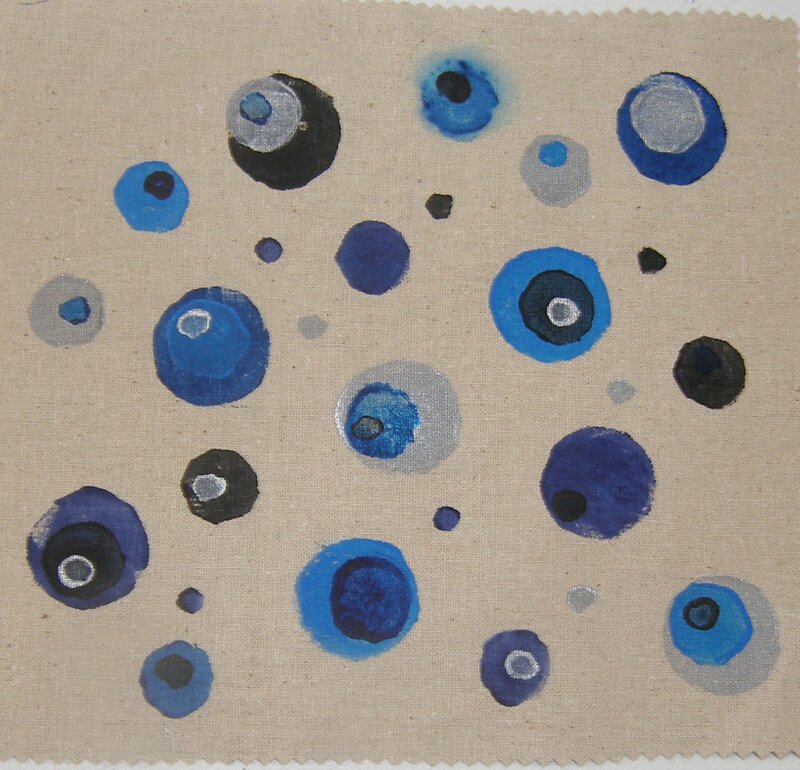 Circles produced from stamps cut out from a computer mouse mat, with acrylic paint on a homespun fabric. I like the basic simplicity of this design with just the one shape repeated in different sizes and colours. Airbrushed background with hand painted bench and stool legs. 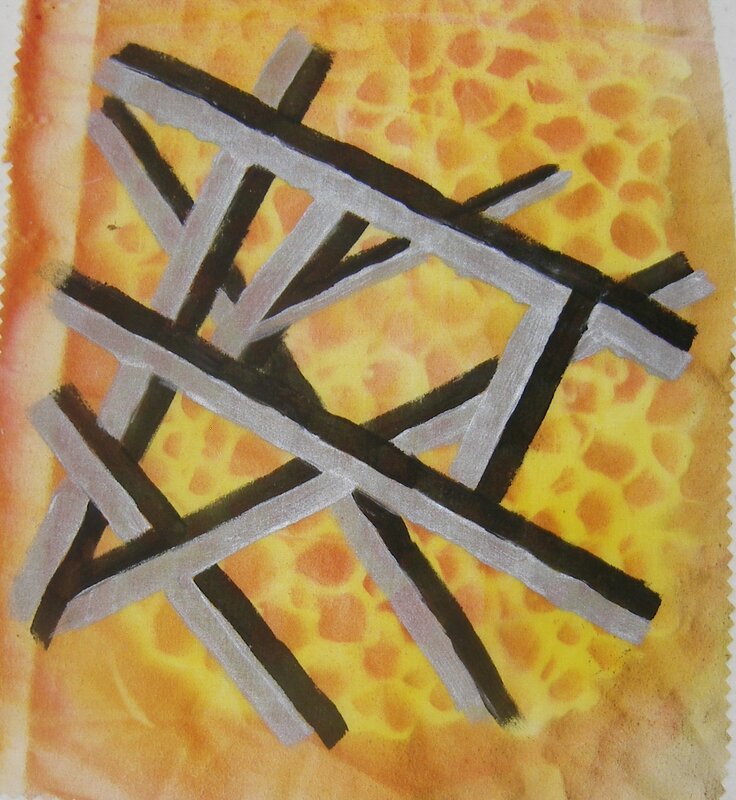 This has great impact with the contrasting colours and the stark, blocky lines. The next three were also based on the Poinsianna drawing. I cut out a stencil to get the basic shapes and applied a base colour for the first two samples then handpainted on the second colour. For the third sample, I used the negative cut outs from creating the stencil, positioned these on the fabric and sponged over with white paint. 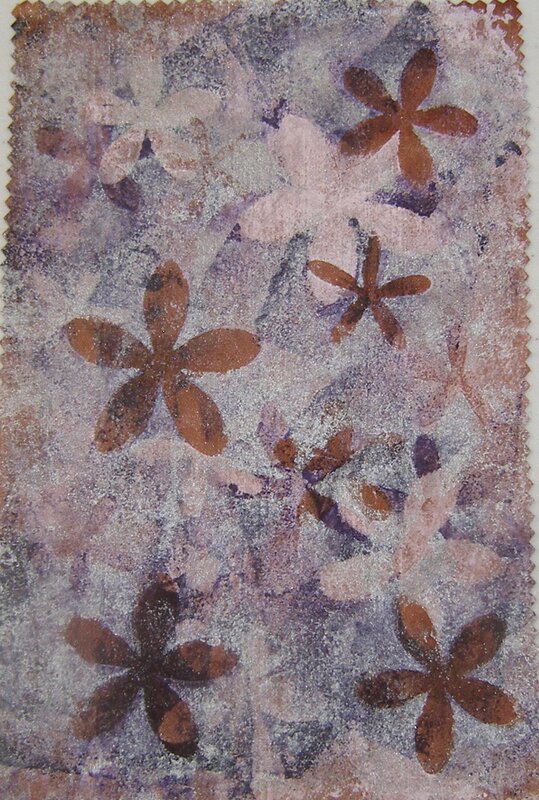 Then I moved the flowers to new positions and sponged with purple paint. Finally I moved the flowers again, this time putting some directly on top of the previous shapes to protect the underlying colour. I lightly sponged this layer with silver paint. I like the colours of this piece and also the depth given by the different layers. I cut a lino block following my leaf design. I applied this first of all to a couple of backgrounds that I had airbrushed. I used a brayer to apply the paint to the lino but only managed to get faint imprints. 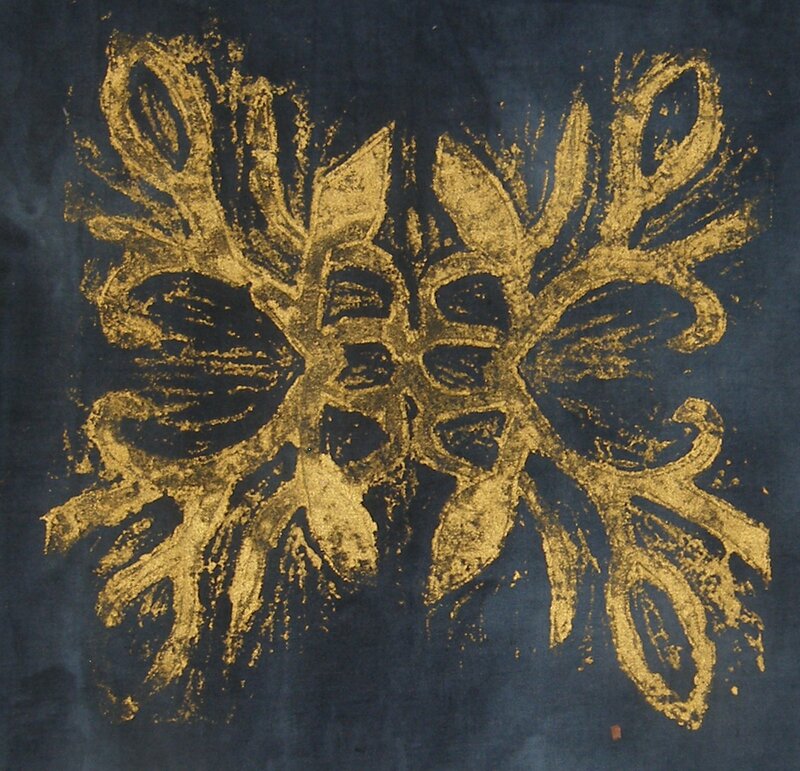 I changed to applying paint with a sponge roller and got much better coverage as shown in this print on a mottled black fabric that I dyed some time ago. Although this method made some of the lines in the cut out areas show, I actually like the softening effect and decided not to cut them away any more. The gold paint showed up much more strongly on the black background. 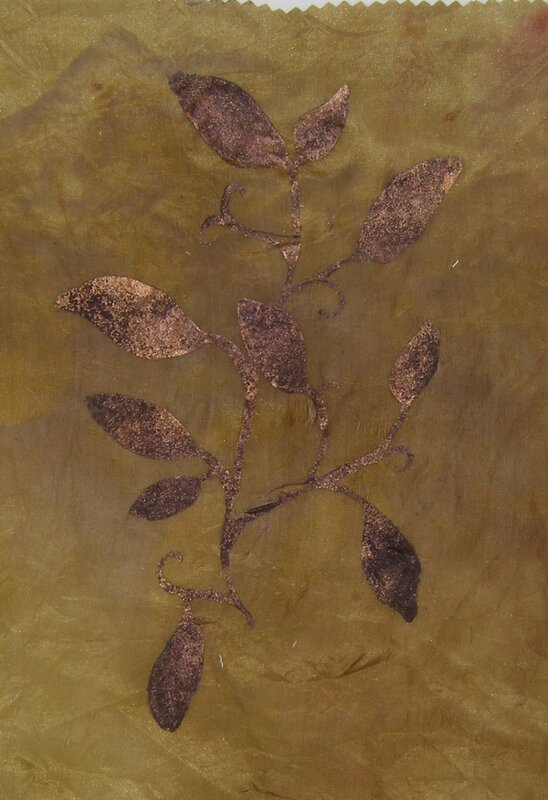 My other leaf design I applied in a number of ways. 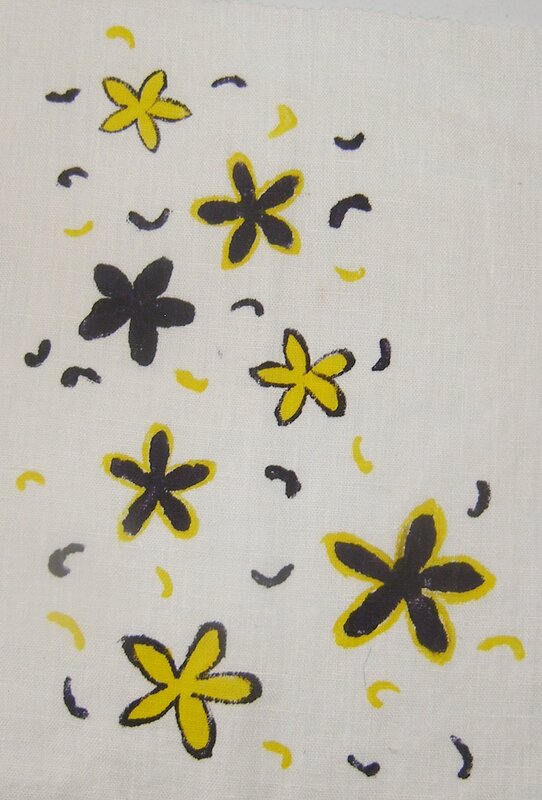 First a screen print onto linen. The stencil has a “floating” section which had to be carefully positioned and secured onto the screen. 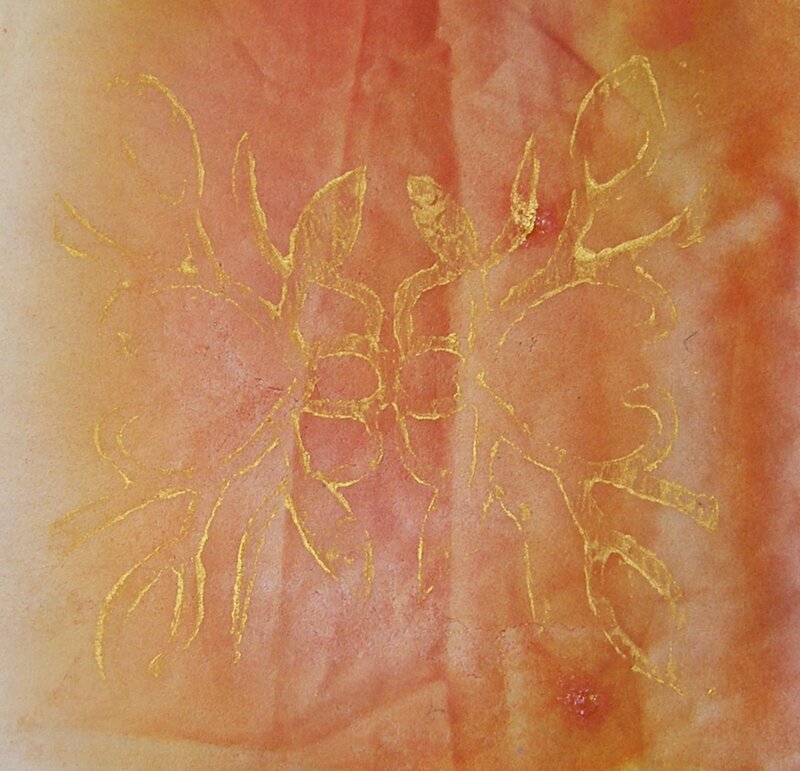 The same stencil was used on silk fabric but this time I sponged the paint instead of screen printing it, using purple for a base and then a copper on top to come up with an autumnal feel. 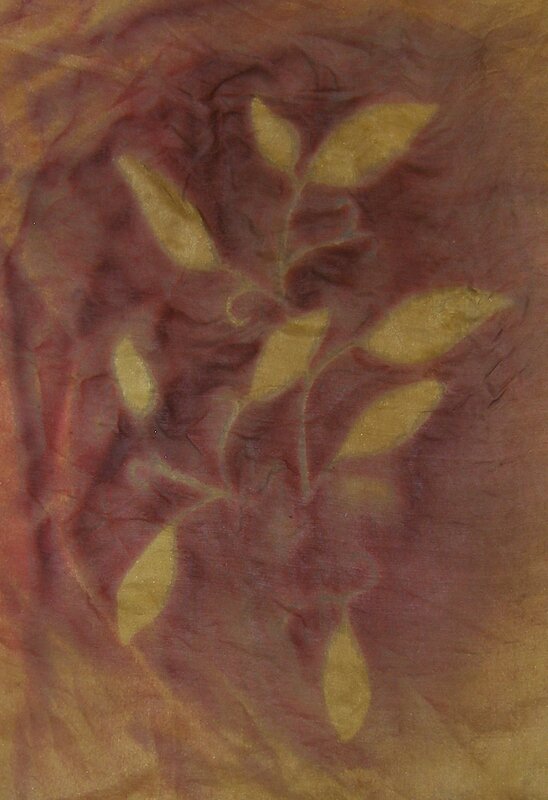 The print below used the negative cut away area from the stencil and I airbrushed over this onto silk fabric. 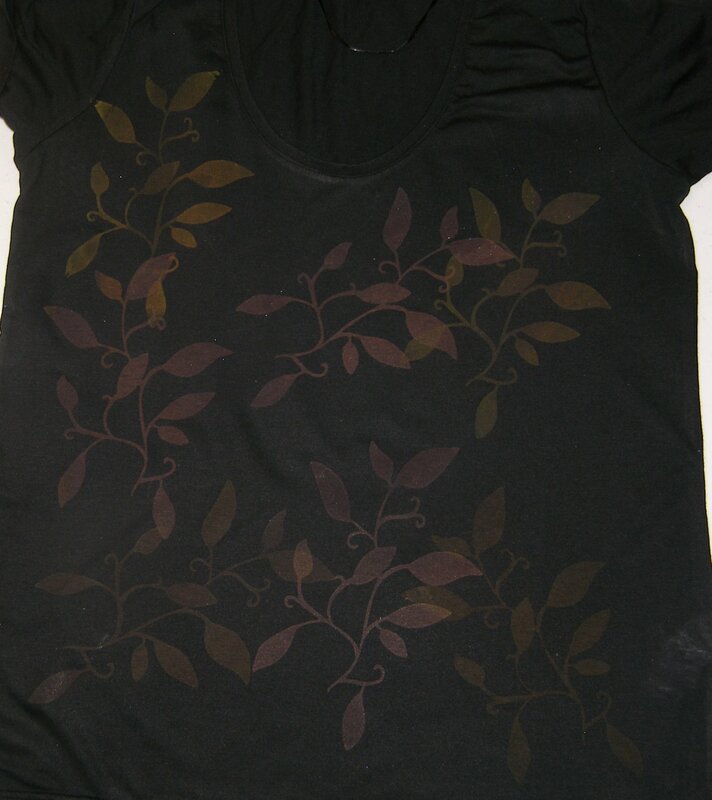 Back to screen printing, I printed the leaf design multiple times onto a black t-shirt using Decolourant Plus. 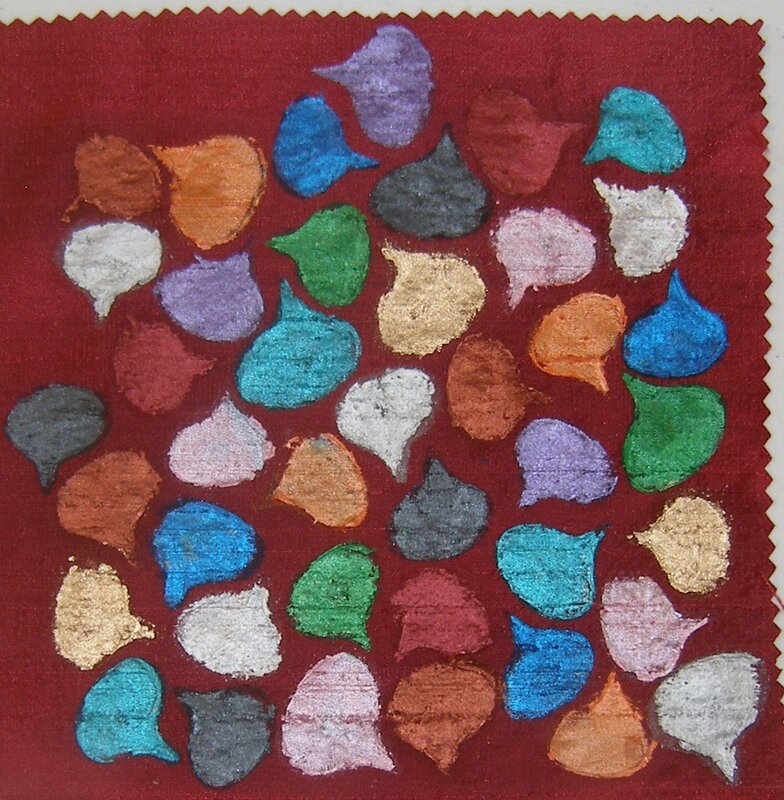 As I used different colours of the decolourant and the shapes overlapped I had to allow drying time inbetween. This has produced a very subtle range of shades. ← Playing with a hot glue gun!